MAKE OR BREAK YOUR HABITS! Rewire Your Habits, Redefine Your Life ! What exactly are HABITS ? What kinds of HABITS do you have? How do we develop empowering HABITS? How do we make a permanent behavior change to better our life? Our daily lives are often a series of habits that are played out through the day. This SCOPE CAMP gives us a simple approach to our HABITS that can better enlighten and empower us! 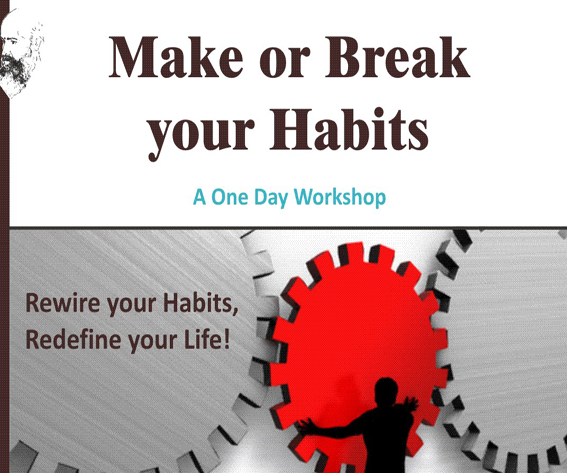 Come and learn simple steps to replace unwanted habits and successfully ingrain a productive behavior. Bring yourself into awareness, wakefulness and presence to MAKE OR BREAK YOUR HABITS !